I get this question posed to me a lot: where can I get married in Las Vegas? I think the better question is: where CAN’T you get married? There are so many special spots around town that the real secret is to find a minister willing to meet you there to marry you at it. Today’s vendor feature is a little bit about this adorably cute pink Volkswagen Beetle, aka the Las Vegas Luv Bug. 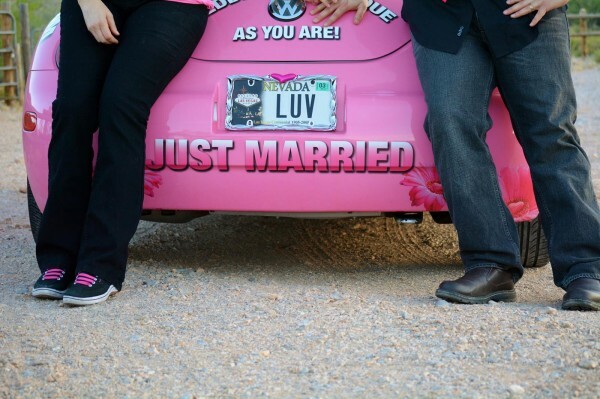 This vehicle transports the dynamic duo of Reverend Tim Rowland and his wife, Pam Rowland around to various marriage ceremony spots in Vegas! Originally from southern California (San Diego), before they transitioned into providing wedding services, they were performing church and ministry work. Using their combined powers of officiating marriages and photography, a desire to work together and provide unique services, Las Vegas Luv Bug was born! 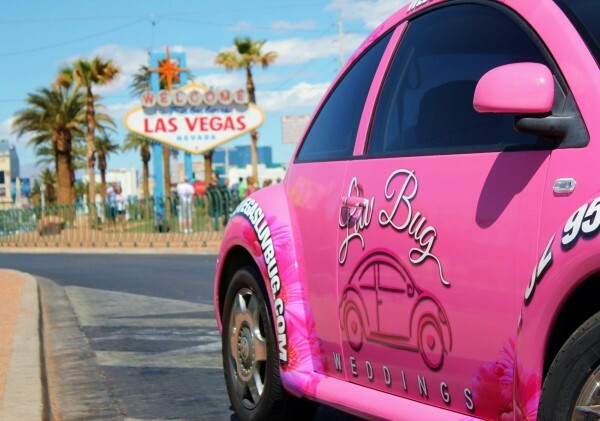 Little Vegas Wedding: For those readers out there who may not know who you and the Las Vegas Luv Bug are, please introduce yourself! 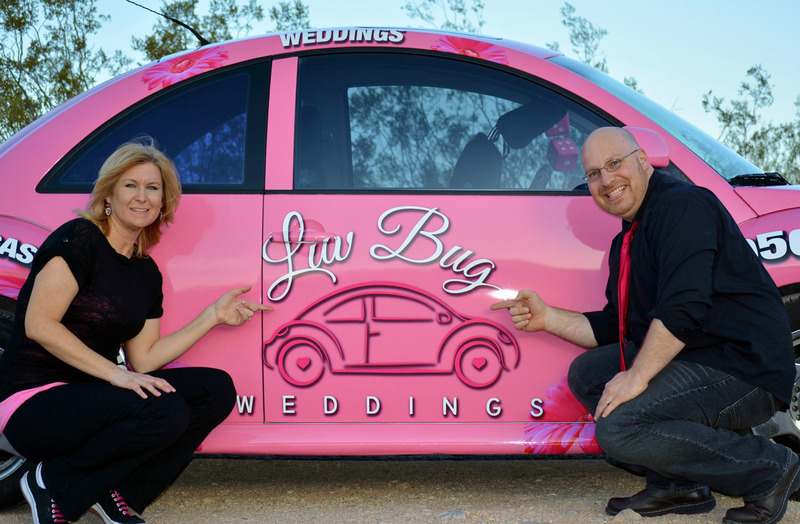 Las Vegas Luv Bug: Las Vegas Luv Bug consists of me, Reverend Tim Rowland and my photographer wife, Pam, and a pink VW Beetle that we have named the “Luv Bug.” Our focus is on meeting the couple wherever they would like to get married, and helping them celebrate their wedding day. We provide officiant/ceremony, 20 digital photos, and a witness if needed. We can also assist with expedited recording of the marriage paperwork or an apostille for international couples. We will go anywhere in the greater Las Vegas area that our brides and grooms request. LVW: How many years have you been in business and how did you initially get into officiating? LVLB, Rev. Tim: We’ve been performing ceremonies for 15 years. We moved to Las Vegas in 1997 to plant a church, which we did for 8 years. I was working a full-time job in customer relations as well as church work in the evenings and weekend services. One of our church members suggested weddings as an alternative income source, so I solicited several chapels and found work a couple of nights a week at a downtown chapel. I began to really enjoy it, and it has taken me all over Las Vegas. Pam has always had a love for photography and taken several courses. She photographed all of our church events over the years as well as family gatherings and annual family photos. This year, we created the Luv Bug so we could work together as a couple, combining our gifts and talents, and having a lot of fun while doing it. Plus, we get to drive a really cool pink “bug” that draws a lot of attention! We REALLY love our pink bug! Some of the ceremonies the Luv Bug has officianted. 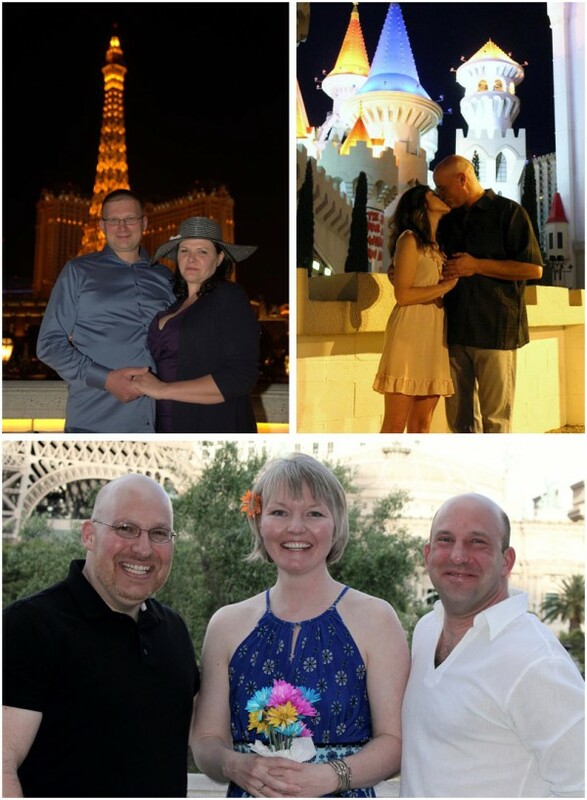 Reverend Tim can be seen bottom photos, far left, with a couple from Canada he wed.
LVW: As far as ceremonies, what kind of variety, customization and personalizations do you offer? Rev Tim: We have a standard ceremony that we use a majority of the time, but many couples have written their own vows, or have specific requests for their ceremony. We are willing to work with any requests a bride or groom may have. One thing I won’t do is prank the bride or groom. Years ago, I had a groom ask me to use his “nickname” for the bride during the ceremony, & I assumed it was a term of endearment between them. As it came out of my mouth, the bride teared up and a look of horror crossed her face. Turns out it was a name that was used to tease her when she was younger and she didn’t find it funny at all. Since then, I have a strict policy of not playing tricks on either bride or groom on their wedding day. LVW: What is your preferred way to work with clients – email, in person, telephone? Rev Tim: We have tailored our website to allow a couple to find out about our services and locations, book a date and time, and submit payment- all online! We are also available by phone or email to answer any questions a couple may have. With international couples, we find email is the most effective, because of the time difference. LVW: Where is the most unique spot you’ve wed people at? Rev Tim: There is quite a long list of locations you can perform weddings at … are there any places you can’t do? Helicopter weddings have to be the most unique, because they can go anywhere. We’ve done weddings on Strip tours, Red Rock Canyon tours & Grand Canyon tours. One of the neatest experiences I had was when the bride and groom had me pretend to be another tourist so they could surprise her parents with their wedding over the skies of Las Vegas at night. Her mother was elated! Casino floors or other private property are generally off-limits, unless the couple obtains the owner’s permission. Most public places are fair game, as well as hotel rooms, homes, or backyards. LVW: Do you provide wedding ceremonies in any other languages other than English? LVW: What is the one thing you wish couples wedding in Vegas knew? Rev Tim: That their choices for getting married are wide open. They can make it as simple or as extravagant as they want (or can afford) so think outside the box, and don’t be bound by tradition! That’s why we say we service “weddings as unique as you are.” We find many couples will spend extra money on a nice hotel suite, where they hold their ceremony, and when all the guests go home, they can spend the rest of their time on a really nice honeymoon where they got married. Our mobile service is designed to be simple and affordable so they can invest their money into other aspects of their celebration. There is much more to a Vegas wedding than the “chapel.” Often, on-location ceremonies provide a much richer background for their photos. LVW: Are there any vendors in the Vegas area you particularly like to work with, or would like to work with? Kent Ripley, Elvis entertainer. First-class Elvis, I’ve worked with several over the years, and Kent is one of the most sincere & fun entertainers I know. It’s not about him, it truly is about the couple. Tony & Kathleen Cooper at Balloons in Las Vegas. They truly are balloon artists, able to transform a room, create a centerpiece that really completes an event. Dana Lopez, bridal beautician at Mosaic Salon does an awesome job as a stylist! LVW: What is your favorite part of the wedding day? Rev Tim: That’s a hard one. I’ll have to split it: Firstly the moments just before the ceremony when the bride and groom have a child-like excitement for what they are entering into, as well as the moments just after the couple is pronounced husband and wife. There is a relief, as well as an expectancy in their eyes. It’s a moment of “We made it!” coupled with, “We are just starting a new part of our lives together!” There is a sweetness there that is hard to describe. It NEVER gets old! If you weren’t a officiants, you’d probably be: Bored out of our minds at 9-5 jobs!! Thank you so much, Tim & Pam! I can’t wait to see you in your little pink Beetle zooming around Las Vegas, delivering love! Visit Little Vegas Wedding's profile on Pinterest.